On March 28 and 29, 2019, Casa Freehold will host a two-day course on how to help adolescents (aged 12 to 18) who are experiencing problems or a crisis in mental health or addiction. This Latina Breast Health Project includes breast health education given in Spanish and free sign-ups for breast exams and mammograms. On Tuesday, April 16, eat at Surf Taco: 25% of your check will go directly to Casa Freehold when you present this flyer. The flyer is valid at any Surf Taco locations: Jackson, Seaside Park, Manasquan, Long Beach Island, Belmar, Silverton, Point Pleasant Beach, Lacey, Long Branch, Red Bank, Rutgers, Hoboken, Princeton. 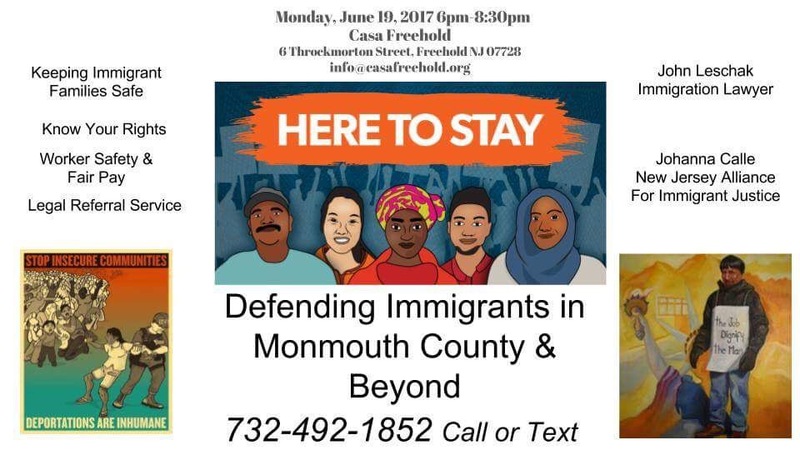 Freehold Regional Education Association is sponsoring a “Train the Trainer: Know Your Rights with Immigration” night along with NJ Alliance for Immigrant Justice (NJAIJ) and CASA FREEHOLD. 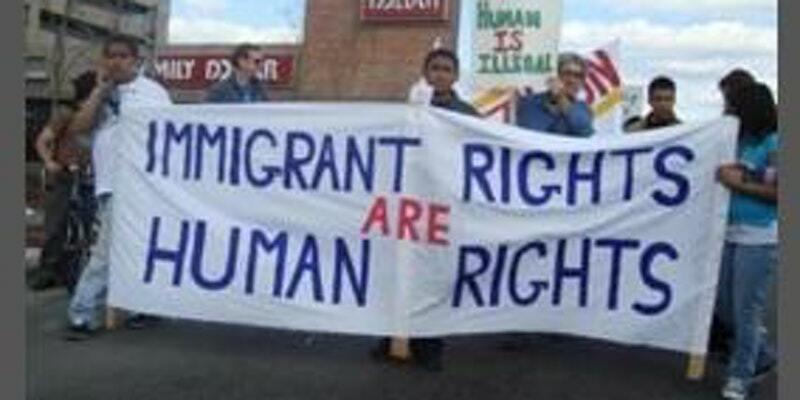 We will be helping to prepare leaders and organizers on best practices and standards for running Know Your Rights workshops in communities. 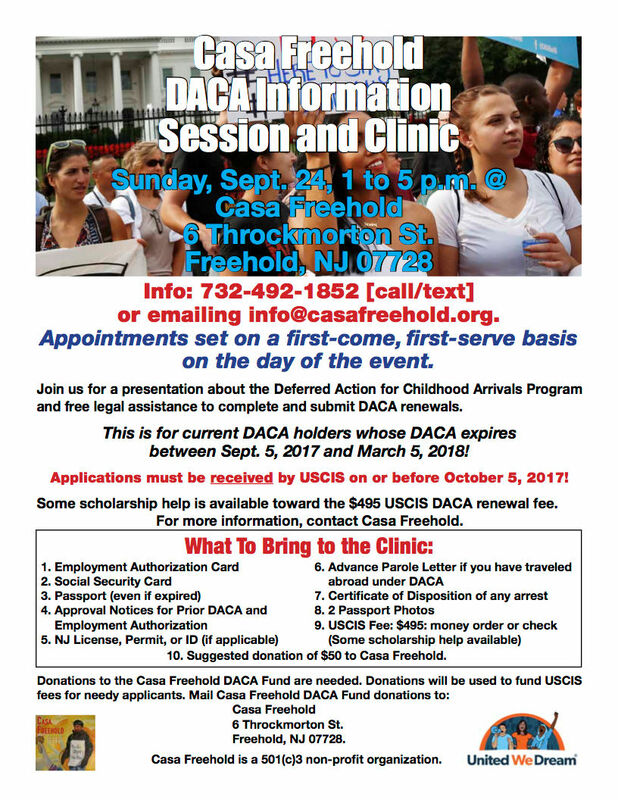 Info session and free legal assistance for current DACA holders whose DACA expires between Sept. 5, 2017 and March 5, 2018. Meeting of religious, education, and community leaders in Monmouth County to discuss joint efforts in support of our immigrant community.